Striking a match, sending a postcard, or even getting dressed, WWII Americans heard the same rallying cry over and over: Remember Pearl Harbor! The smoke had scarcely cleared from Pearl Harbor’s Battleship Row when America, suddenly at war, dusted herself off and rallied her people with a spirited battle cry: “Remember Pearl Harbor!” This watchword of victory—RPH for short—instantly showed up everywhere: on posters, pins, medals, patches, and every kind of item imaginable. Over four long years of war, RPH items reminded a beleaguered America why it was fighting. Today, they remind us of a time when an entire nation mobilized for a single purpose. Propaganda badges: Propaganda badges were made of celluloid, about an inch and a half across, and imprinted with anti-Japanese slogans. They were funny, even outlandish, flashing quips such as “Down with the Rising Sun—Let’s Not Forget Pearl Harbor” and “Pound ’em for Pearl!” Thousands were produced during the war. Today they are rare but still relatively affordable. Matchbooks: In a hard-smoking era, the federal government and private businesses circulated millions of matchbooks featuring brightly colored images of airplanes, battleships, sailors and soldiers. One book held matches made to look like menacing Japanese soldiers. Its cover read “Strike ’em Dead—RPH.” The backs of the books usually featured patriotic messages reminding Americans to buy defense bonds and stamps. Cinderellas: Cinderellas were styled after postage stamps and came in various sizes and shapes. Windows all over America were plastered with them. Collectors gave them their name—like Cinderella who wasn’t allowed to attend the ball, these decorative stamps are excluded from official stamp-collecting exhibitions. They were typically lithographed on adhesive paper or made into decals, stickers, stamps, or labels. People stuck them on envelopes, stationery, book covers, or postcards. One particularly bold decal was a four-inch circle with a sinister caricature of a Japanese soldier’s face and the grim caption “RPH—Keep ’em Dying.” A class at US Army Air Forces Basic Flying School at Moffett Fileld, California, co-opted this decal as its coat of arms. Jewelry: There were more than 500 known varieties of Remember Pearl Harbor jewelry, including pins, brooches, pendants, lockets, necklaces, earrings, and bracelets. Pieces varied in size and quality and were engraved, die-cast, enameled, or emblazoned with the RPH motto. The manufacturer’s name was usually stamped on the back. Postcards: Postcards started coming out almost immediately after the attack. One popular three-by-five RPH card cast Axis leaders Benito Mussolini, Hirohito, and Adolf Hitler as “Three Dirty Dogs.” Another, printed in red, yellow, and black, depicted the same trio as rats. 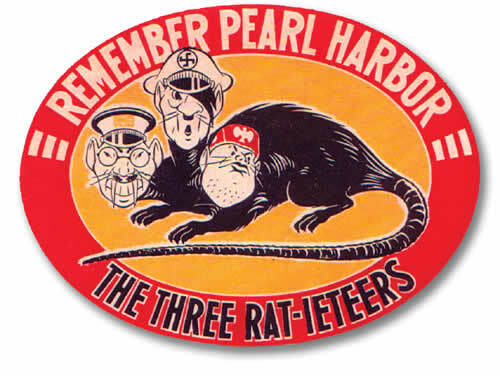 The caption read, “RPH—The Three Rat-ieteers!” One of the funniest postcards ever produced by publisher E.C. 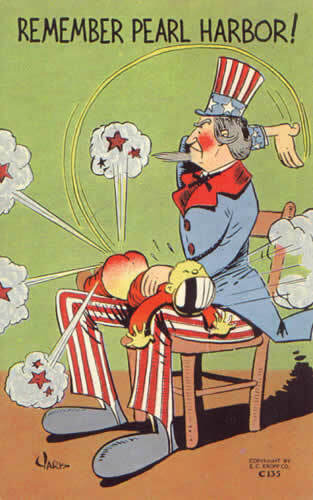 Kropp features the RPH slogan and a cartoon of Uncle Sam spanking a Japanese soldier. Postal covers: From 1941 to the war’s end, Americans bought thousands of the graphic envelopes that collectors call postal covers. Often adorned with comical illustrations and RPH captions, and normally three inches high by six to nine inches wide, they were designed by prominent illustrators of the time. Examples included “U.S.S. Lansdowne—Another Ship Commissioned to Bring Revenge to Pearl Harbor,” and an envelope bearing a quote from navy commander in chief Admiral Ernest J. King, with a Victory V, armed GIs, flag buntings, and an RPH caption. Sheet music: Johnny Noble was among Hawaii’s best-known musicians and songwriters. Following the Pearl Harbor strike, he wrote the song “RPH,” which was released in early 1942. Don Reid and Sammy Kaye penned and composed a tune by the same name for release in late 1941. Collectors are attracted to the strong graphics on the printed song sheets for these and other tunes. Hawaii invasion currency: By August 1942, the federal government had withdrawn all regular US currency in Hawaii and replaced it with specially printed notes with “HAWAII” overprinted in large letters on the back and vertically at each end on the front. If the Japanese invaded Hawaii and seized US money, the bills would be permanently identifiable as having been captured by the enemy, and would not be honored by the United States. Gum cards: Gum cards were for the kids. Gum Incorporated of Philadelphia, with its Blong gum, put out hundreds of different battle scenes on two-by-three-inch cards. Candyland Company of Brooklyn issued an eight-card photographic series called Heroes of Pearl Harbor. Arcade games: There were several kinds of penny arcade games with RPH themes seemingly tailored to give children nightmares. Games with graphic illustrations of evil Japanese dealing death and destruction on Pearl Harbor featured planes that flew, swivel guns that shot, turret guns that turned, firing artillery, exploding bombs—all with realistic sound effects. There were gumball-firing machine guns that shot down Japanese planes. Arcade proceeds from these games were usually donated to the war effort. The games are extremely difficult to find today. Toys and playthings: Major toy suppliers FAO Schwarz, Milton Bradley, and Parker Brothers manufactured mechanical and electrical toys, puzzles, painting sets, toy soldiers, pistols, rifles, model airplanes and ships, toy trucks, board games, card games, punchboards, banks, and paper dolls with RPH themes. Many were made of materials deemed inessential to the war effort, such as wood and plastic. The RPH slogan was immortalized on every item imaginable, including the Par-A-Shoot Target Game by Baldwin and the Trap the Jap in Tokyo marble game by Modern Novelties. These items are just a small sampling of what was made and sold during the war. A vast number of other RPH collectibles were available, including pennants and banners, figurines and statues, license plates, drinking glasses, scarves, handkerchiefs, and neckties. Many are still around, reminders of the sacrifices America made during World War II and cherished treasures of our nation’s heritage. Martin Jacobs, a collector of Pearl Harbor memorabilia for almost 50 years and an expert on and appraiser of WWII home-front collectibles, is co-author of Remember Pearl Harbor Collectibles (2000). He can be reached at MJacobs784@aol.com. This article appeared in the December 2006 issue of America in WWII magazine. Order a copy of this issue now. Images: A postcard caricaturing Tojo, Hitler, and Mousolini; and the cover of a 1942 Street and Smith comic book showing Uncle Sam setting out to teach Japan a lesson.